For centuries, the idea of setting sail on a sea voyage has captured the human imagination; with the varied beauty of the ocean inspiring art, literature and poetry. There are some people who long to experience the wonder for themselves, taking off into the open water for weeks at a time; whether for work or as a personal passion. 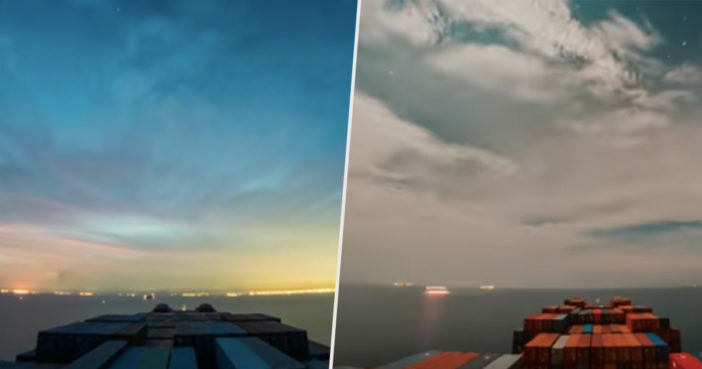 One man has documented his own adventure through a breathtaking time-lapse video; capturing the many moods of the ocean during his 30 day journey from the Red Sea to Hong Kong by shipping barge. YouTuber JeffHK from Hong Kong travelled through eight separate bodies of water, via the Gulf of Aden, Indian Ocean, Colombo, Malacca Strait, Singapore and South East China Sea. The result, which includes 80,000 photographs, is dazzling. Along the way, Jeff saw the skies glitter with stars and the ocean darken beneath thunderstorms. He saw both sunrises and bright port lights blaze across the waves, and captured the Milky Way in all its splendour. 30 Days of Timelapse, about 80,000 photos combined. 1500GB of Project files. Sailing in the open ocean is a unique feeling and experience. I hope to capture and share it for everyone to see. The route was from the Red Sea to the Gulf of Aden to the Indian Ocean to Colombo to Malacca Strait to Singapore to South East China Sea to Hong Kong. The footage is accompanied by music (Philip G Anderson’s Winter and Stellardron’s Billions And Billions) which carries you away as if on a cloud. Those who have seen the mesmerising footage have thanked Jeff for taking them with him on this remarkable trip; a journey many of us will never have the chance to take in reality. One person described the footage as being ‘the closest video you can get to heaven on YouTube’, while another agreed it was ‘just magnificent’. OMG! One of the finest videos on YT! Simply mesmerizing, and for a meteorologist, fascinating to see the weather systems and cloud patterns. There is just so much detail between sky, clouds, ships, sea state, sunlight, airliners, colors, sunrises, sunsets, stars, navigation, ports… wow. Thank you. This was truly SPECTACULAR. Actually one of the most beautiful videos I’ve ever seen. The night time of the universe was truly awe inspiring. Makes one realize truly how small we are; a good thing to remember when one has problems they feel are overwhelming. Take ten minutes to watch this and it puts life and its problems and situations quickly in their proper order. Meaning not that important at all. I’m sure I’m not the only one to feel a little emotional after watching this video. Anyone else sorely tempted to pack up their belongings and set sail? Follow more of Jeff’s adventures for yourself through his Instagram account.